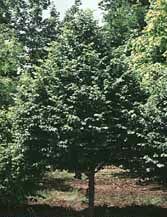 Here is a beautiful, round-headed tree perfectly suited for use in smaller yards. Slow growing to 35 ft. high and 25 ft. wide, it bears 10-12 inch long, dense clusters of attractive, bright-red flowers that are favored by hummingbirds. Growing best in sun, it has glossy green leaves that turn bright yellow in the autumn. Masses of red buds burst into a cloud of white blooms on this charming little dwarf tree, followed by green foliage then miniature golden amber fruit in autumn. Growing only 5-6 ft. tall, the neat and tidy head of this 'lollipop' rarely exceeds 3 ft. in diameter. Extremely disease resistant, it does best in sun or part shade. 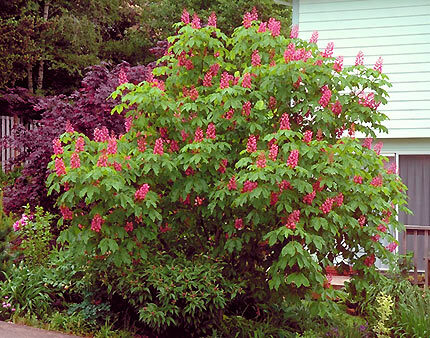 Brilliant red buds open to a snow-white "cloud-burst" each spring and cover the canopy on this small oval upright tree that is similar in shape to Lollipop. Crisp green foliage replace the blooms and turn golden in the autumn. The small golden fruit add to its attractiveness and persist well into the new year. Extremely disease resistant, it could reach 8 ft. tall and wide and thrives in full sun. This 'sweet' variety bears crisp green foliage and pale pink buds opening to sugar white blooms on an upright oval head. Masses of 1/2 inch sized red fruit follow, which offer an amazing show in the fall, through the winter and that persist well into spring. 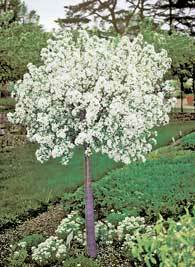 A very disease resistant crabapple variety that could grow to 20 ft. tall in sun. This slow growing male selection of Gingko is a very symmetrical, upright branching tree which becomes broad and spreading at maturity. Deep green leaves turn bright yellow in the autumn. 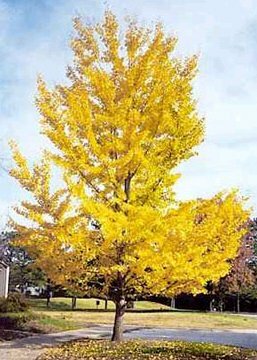 Gingkos are some of the oldest living plants on earth, with fossilized leaves from the Gingko having been found during the time of the dinosaur. Could grow 30 feet tall in sun at 6-8 inches per year. 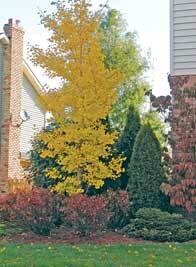 If space is limited, yet a sun-loving tree is desired, this gingko is worth looking at! Extremely tolerant of city conditions, it is shorter and narrower than the regular species and grows extremely slowly to 40 ft. tall and 15 ft. wide. Green leaves resembling delicate 'fans', turn stunning golden in the fall. As it is male, it does not develop fruit. Beautiful heart shaped leaves with a delicate texture makes this an excellent landscape specimen. Growing approximately 12 inches per year to 40 feet tall by approximately 25 feet wide, it has a symmetrical full head and suffers from few diseases and insects. Blue green summer foliage turns a lovely yellow or apricot orange in autumn. Interesting candy floss scent is evident in late summer or early fall as the leaves are preparing to fall. This newly introduced hybrid combines the pyramidal shape of the English Oak with the extreme drought resistance and hardiness of the Swamp White Oak. Dark green leaves feature silver lower surfaces, turning yellowish-brown in autumn. Growing slowly to 50 feet tall, it will thrive in both wet or dry soils. 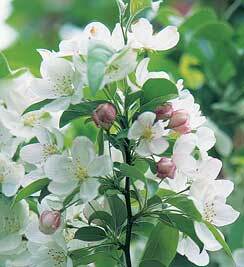 This sturdy, compact, oval tree produces fragrant creamy-white flower clusters in early July. It has attractive cherry-like bark that is quite pretty in the winter. 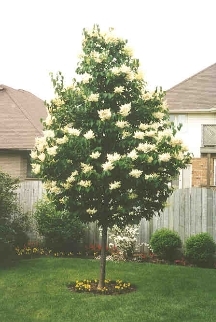 A very hardy tree that grows relatively slowly to 25 ft. tall at about 1.5 ft. a year. A perfect small tree for a residential city lot. Here is a narrow, densely pyramidal dwarf 'sprite' that grows 20 ft. tall but only 10 ft. wide and is covered with heart-shaped small green leaves. Highly scented, drooping yellowish clusters attached to greenish-yellow bracts form in the mid-summer. 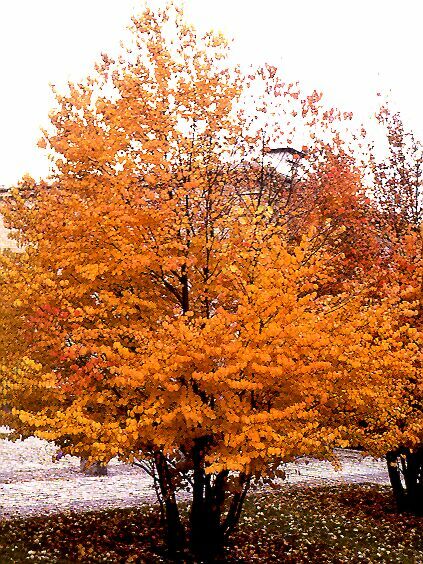 Foliage turns bright yellow in autumn before falling.